With its unique Buddhist temples, rich culture and wonderful sceneries of green Myanmar is a well sought-after tourist destination. 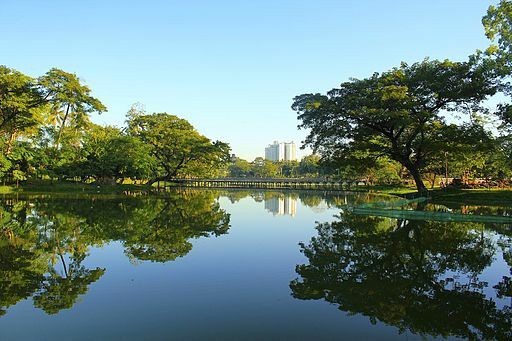 One such attraction is the stunning Kandawgyi Lake in Yangon. This is one of the main lakes in Myanmar, it is an artificial lake built by the British in order to provide clean water to the city. The river is huge with a 5-mile circumference and 20 to 45 inches deep. The lake is literally known as the ‘Royal Lake’ and is seen in all its glory in the light of the setting sun. On the Kandawgyi Lake sits the replica of an ancient palace called ‘The Karaweik Palace’. This palace is a national monument of Myanmar and is seen even on the currency there. The palace is now a restaurant with an international buffet and many cultural shows which include the best traditional dances and princesses from the past (actresses dressed up in real looking costumes). Towards the south of the lake, you will find a Shrine dedicated to Shin Upagot. He is said to be a prophet from the Buddhist religion and locals strongly believe that Shin Upagot protects the worshippers from dangers such as natural disasters. Therefore, Shin Upagot is greatly venerated in Myanmar. Towards the east side of the lake is a park where you may have to pay an entrance fee to walk in. This park is filled with playgrounds for kids and many restaurants and cafes, so grab a bite to eat while you pass by. Staying in a hotel in Yangon Myanmar such as the luxury hotel Chatrium Hotel Royal Lake Yangon? Take an hour or two to wander through this amazing park. At first glance, you might think it’s just a towering pile of rocks, but in fact, it is a place that provides visitors with all kinds of entertainment. The complex includes bars, a massage parlour and even a viewing deck on the fifth floor. On the ground floor is a gallery of paintings by local artists.